Firefox extension to manage downloads"
One of the persistent problems that users encounter when using browsers is the issue regarding download. The procedure of downloading itself is so strenuous, especially when there are many files to download, the user will have to manually right click and choose the famous “save as” command to save the file. After downloading a file, it is difficult to locate the file and use in the future. The simple solution to this multiple problems is a download manager. A download manager is a powerful utility that takes charge of downloading files on your browser. Besides automating downloads, these applications can speed up download time, and some make a logical arrangement of downloaded files in various classes according to file types. This makes it easy to locate downloaded files at a later date. However, some download managers do not integrate perfectly with the Firefox browser. To solve this problem, all you need to incorporate any supported download manager into the Firefox browser is Flashgot. This application creates the missing connection between Firefox and your preferred download manager. 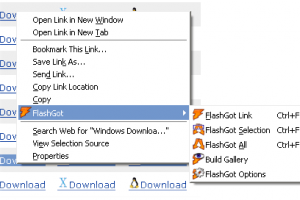 Once the user downloads with Flashgot, the target download manager is seamlessly initialized. 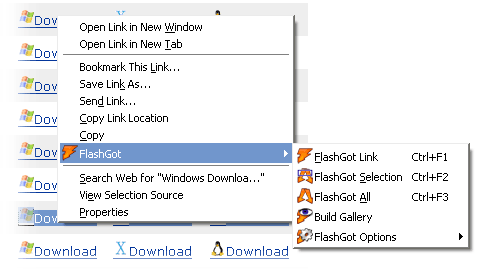 FlashGot is licensed as freeware for PC or laptop with Windows 32 bit and 64 bit operating system. It is in mozilla extensions category and is available to all software users as a free download.